Okay, if I were going to review a book purely on aesthetic, this one would already be a winner. Like, seriously. I have never wanted to start gardening so badly as I did after reading about these epic characters. I loved everything from the style, the plot, and just… the book. Seriously, it was a fantasy wonder. I’m kind of stuck here, as my favorite part of this book might also be considered a spoiler…? It is firs discussed early in the book, and I will refrain from discussing its direct involvement in the plot, but be warned if you are very sensitive to spoilers. Anyways. This book dealt with one of my favorite topics–and that would be how a person’s identity is connected to, and affected by, their memories and experiences. One of the main characters is constantly shifting between remembering their past, and being an amnesiac. So, throughout the story, this character is approached with two story arcs–that of their real self, and that of their “brainwashed” (if you will) persona. The two are very different, yet one in the same, and the connection that they had was truly fascinating, probably my favorite aspect of the plot. Then we have the style of the writing itself, and the way it focused on nature (kind of) which I really loved. To start, the writing was really light and refreshing. Fantasy can be written in a very long winded, drudging sort of way. And, while this isn’t a bad thing, it can make fantasy novels harder to get through in general. However, Rosemarked had a very well developed world, society, and atmosphere, while not weighing the reader down with worldbuilding. Also, I just loved hwo much of the story revolved around healers being super important. Rather than healers, with their weird animals and love for plants, being sidekicks, they were the heros of this story. The healers were story, scary, and admirable. I loved that, and I now very seriously want to start a garden again (and get a super cool pet snake, but that’s another thing). 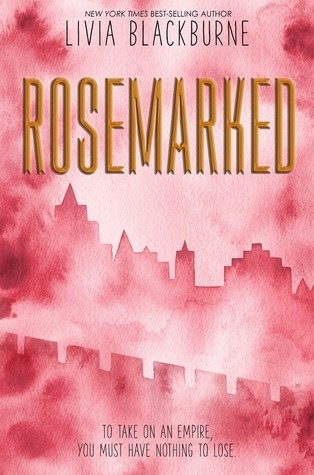 Overall, I adored Rosemarked and cannot recommend it enough. It really does remind me of Leigh Bardugo novel, with the style and world that was created. If you enjoy a light, but still very serious and enthralling fantasy-type novel, this is the perfect read.